Teal are at all-time record highs. Mallards increased dramatically. Pintails bounced back. Canvasbacks counts soared. The Dakotas are drenched with ducks. The 2009 fall waterfowl forecast is in, and it looks just plain ducky. Buoyed by vastly improved spring water conditions across key duck production areas in the northern United States and Canada, spring breeding survey and pond counts indicated a breeding population of 42 million ducks, up from 37.3 million in 2008, a 13 percent increase. Further, pond counts were 6.434 million, an astounding 45 percent increase over last year's tally. Recharged water conditions should mean more ducks over your decoys this season, as well as increased opportunities to shoot more of them. Liberal season frameworks are in place in all four flyways, so duck hunters will have 60 days in the Atlantic and Mississippi flyways, 74 days in the Central Flyway and 107 days in the Pacific Flyway. After closure in 2008, canvasback hunting is offered in all four flyways, and daily bag limits have increased for bluebills. The daily limit on pintails increases to two in the Pacific Flyway, and Central Flyway hunters will have the option of a third wood duck in the bag this season. "We've seen some resurgence in the numbers of pintails and scaup, which has given us the opportunity to provide more hunting for those species," said Paul Schmidt, assistant director of migratory birds for the U.S. Fish & Wildlife Service. "We've seen the canvasback population rebound well. It's sufficient for us to offer a full canvasback season this year." Goose numbers are not as glowingly positive, However, most Canada goose and snow goose populations are comparable with 2008 numbers, and hunting season structures are similar to last year. Following is a more detailed look, flyway by flyway, of what you can expect in the skies during the 2009-2010 waterfowl season. Overall, the fall flight should be similar to 2008, although mallard and wood duck numbers are expected to be slightly higher than last season. Mallard estimates are up 3 percent in the eastern survey area and 8 percent in the Northeastern U.S. And according to the North American Breeding Bird Survey conducted in May and June, wood duck numbers in the Atlantic Flyway increased. "A lot of rain in the Northeast should be good for brood production, especially mallard and wood duck populations," according to Bryan Swift, Game Bird Unit leader for New York Department of Environmental Conservation. "Most of the wood ducks born in this area make to the southeastern portion of the flyway. Hunters in these areas should see an increase in migrating wood ducks this year." The breeding population of American black ducks in the eastern survey area was similar to 2008. "Black duck breeding populations in the northeastern U.S. are declining annually, but a relatively small number of Atlantic Flyway black ducks come from this area," Swift said. "The majority comes from areas of Canada, and their populations have remained relatively stable, which is good news for Atlantic Flyway hunters." Hunters in some areas of the Atlantic Flyway will benefit from the excellent water conditions in the Dakotas. Spring ponds more than doubled in the Dakotas, providing critical water for nesting ducks. Across North America, spring breeding surveys counted 8.5 million mallards, a 10 percent increase over 2008. At 3.44 million, green-winged teal are at an all-time high, and blue-winged teal numbers came in at 7.38 million, the second-highest figure ever in the history of the survey. "The southeastern portion of the Atlantic Flyway will benefit most from the high numbers in the Dakotas," Swift said. "Atlantic Flyway hunters get roughly half of their migrating mallards from areas west of the Atlantic Flyway, including the prairies and the Great Lakes." Most of waterfowl habitat in the eastern survey area was considered good, although southwestern Ontario experienced flooding from a series of major storms. Later-than-normal winter conditions in the James and Hudson Bay Lowlands reduced habitat quality and production there. Biologists predict hunters who depend on migrants from these areas will see fewer young-of-the-year ducks and geese this season. Boreal forests in the eastern survey area provided generally good breeding conditions this spring, with the exception of the northern areas of Quebec, Ontario and Labrador, which experienced a very late spring. Biologists are hoping the good overall breeding conditions make up for the decreases in production in these northern areas. Scaup and scoter (black, white-winged, and surf) numbers were up 18 percent in the eastern survey area, so sea duck and diving duck hunters should benefit. Good to excellent conditions were reported throughout New York and much of southern Quebec and Ontario. From Maine to the Maritime, above-average snowfall was recorded, and average spring temperatures prevented flooding, which resulted in good-to-excellent breeding and duck-rearing habitat. Waterfowlers who hunt the Chesapeake Bay and south along the Atlantic seaboard should see an increase in migrating diving duck species such as canvasbacks and bluebills from the Prairie Pothole Region. The Great Lakes of the Atlantic Flyway should also see a jump in migrating numbers of ducks. The forecast for the production of North America's geese is regionally variable. Below-average winter snowfall and mild spring temperatures contributed to an early snowmelt in Newfoundland, which benefitted the North Atlantic population of Canada geese. Clutch sizes appeared larger than average, so a fall flight similar to last year is expected. Atlantic Canada geese throughout Quebec had an 11 percent nesting decrease. Biologists predict production to be poor to moderate, so a reduced fall flight from that population is expected. However, resident Canada geese experienced excellent production, which should help balance out lower numbers migrating through from northern breeding grounds. of its lesser snow geese and Ross's geese from the Mid-continent population. Poor production -- with the exception of Baffin Island region -- will contribute to a below-average fall flight containing fewer young birds. Meanwhile, greater snow geese experienced good production and an above-average fall flight is expected. "Greater snow geese are a concern because of their high numbers," Swift said. "We encourage hunters to participate in the Conservation Order rule. This allows waterfowlers a snow goose hunt after the normal season, and it will be implemented in six states." Most of the Atlantic brant nest on the islands of the eastern Canadian Arctic. Harsh spring weather conditions account for a 7 percent decrease in nests from last year. Overall, the Atlantic brant production is expected to be below average, and the fall flight should be down slightly. In the grand scheme, waterfowl hunters should expect a good season. Teal numbers are sky high, mallards are up nicely overall and gadwalls are strong. But hunters at the top of the flyway -- especially if they rely heavily on locally reared birds -- are far less likely to have an outstanding season than their brethren farther down the flyway. "The southern part of the Mississippi Flyway will certainly benefit from the water in the Dakotas," said Kent Van Horn, migratory bird ecologist for the Wisconsin Department of Natural Resources. "But water conditions-wise, Wisconsin and Minnesota are in a drought. It's dry." Great Lakes nesting mallards -- which accounts for surveyed ducks in Wisconsin, Minnesota and Michigan -- totaled 690,000 this spring. The number is up slightly from 2008, but still below the average for the past 15 years. Van Horn points out that 70 percent of ducks killed by Wisconsin waterfowl hunters were raised in Wisconsin, so local production plays a huge part in the success of the season. Minnesota and Michigan duck hunters also depend greatly on birds produced in their own marshes. Still, waterfowl hunters in the northern part of the flyway will benefit from outstanding duck production in the Dakotas and the Prairie Pothole Region in Canada. More migrating mallards, teal, pintails and bluebills should wing through this fall. Pools of the Mississippi River should be loaded with birds, and hunters on traditional diver duck hunting areas such as the Great Lakes and other large shallow-water lakes should benefit from increases in bluebills and canvasbacks. Spring breeding surveys found 662,000 canvasbacks, up from 488,000 in 2008, prompting a reopening of a season this fall. In addition, bluebill counts were just shy of 4.2 million, a 12 percent increase from 2008. "It's the third year in a row we've seen a scaup increase," Van Horn said. "When you've had a small increase three years in a row, it's time to stop saying scaup are declining." Hunters from Illinois to Louisiana should spy more teal, as both bluewings and greenwings are near record numbers. Combined, 10.8 million teal were counted in the breeding survey. Gadwalls jumped 12 percent to 3.05 million, and redheads remain near all-time high levels of just over 1 million. The outlook for Canada geese is less spectacular. An extremely late spring wiped out much of the nesting effort in Hudson Bay, although southern James Bay geese did fair, Van Horn said. However, goose hunters should remain optimistic. Nest counts are down 35 percent for Mississippi Valley Population geese, but the overall population is only down 3 percent, because 2006 and 2007 were very good production years. "There's still a lot of geese out there," Van Horn said. "There are just very few young of the year." Giant Canada geese had average production -- 1.9 million -- after 1.89 million in 2008. Abundant local geese should help balance out slight decreases in migrating Canadas. "There are going to be giants out there," Van Horn said. "It was a good year for resident geese in Wisconsin. Spring came early." Excellent breeding conditions in the Dakotas and eastern Montana should translate into excellent hunting. Breeding duck estimates in the north-central U.S. were 108 percent above last year's estimate and 87 percent above long-term average. Mallards, pintails, gadwalls and teal are having a banner year. "The water conditions provided good breeding conditions for ducks, and most all duck numbers are up, meaning the Central Flyway should see a healthy migration this fall," said Mike Szymanski, waterfowl biologist for the North Dakota Game and Fish Department. Breeding ducks increased 117 percent in eastern Montana and the western Dakotas. In recent years, the western and central Dakotas and the prairie pothole region of Montana had been relatively dry, so most of the breeding efforts took place in the eastern portion of the Dakotas. "This resulted in the majority of waterfowl migrating through the central and eastern parts of the flyway," Szymanski said. 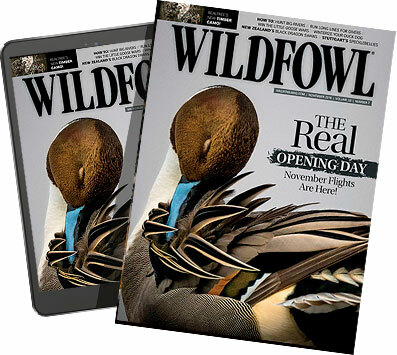 "Waterfowlers will see more ducks migrating down the western side of the Central Flyway meaning ducks will be more evenly dispersed throughout the flyway than in years past." Hunters will see a lot more young birds this fall. "These birds are more vulnerable to hunters because they are more likely to wander into the decoys," Szymanski added. While the Prairie Pothole Region of the United States experienced prime breeding conditions, much of Alberta's prairie potholes were mired in record drought. Many ducks that relocated throughout the Dakotas and eastern Montana. Southern Alberta experienced a 22 percent decrease in nesting ducks. Biologists are hoping the Dakota region's improved habitat conditions will make up for the shortfalls in the dry areas of Canada. With near-record numbers of blue-winged teal and green-winged teal, all Central Flyway states permitted to have special September teal seasons will be afforded 16 days this year. The abundance of teal should provide fast action from southern Canada to Texas. Mallards are up 26 percent in Montana and the western Dakotas, and the eastern Dakotas experienced a 62 percent increase. Waterfowlers throughout the flyway should see more mallards this season. Pintails, redheads, canvasbacks, northern shovelers, scaup and gadwalls increased in the Prairie Pothole Region. After years of declining numbers, breeding pintails increased 23 percent in North America to 3.1 million. Montana and the western Dakotas experienced a dramatic 662 percent increase, while the eastern Dakotas experienced a 245 percent increase. Scaup and canvasbacks jumped substantially. Montana and the western Dakotas experienced a 111 percent increase in scaup, and the eastern Dakotas boasted a 110 percent increase. Canvasbacks increased 198 percent in Montana and the western Dakotas, and 210 percent in the eastern Dakotas. Farther south, many states need water for the sole purpose of stopping ducks and geese migrating down the flyway. "We need rain to fill the marshes," said Mark Vrtiska, waterfowl program manager for the Nebraska Parks Commission. "The Rainwater Basin is relatively dry, and there's just not that much water on the landscape." In Coastal Texas, a major drought has set in. "It will undoubtedly affect the overall harvest in the Central Flyway," Vrtiska said. "Many birds of the flyway also depend on the area for wintering purposes." Goose hunters should see a lot of large Canada geese. The larger Canada geese that nest in the United States and southern Canada had a good nesting season, and populations continue to do well. However, cold weather and snow cover persisted later than usual in parts of the eastern Arctic and central Arctic, which considerably delayed the nesting of snow geese and small Canada geese. Decreased production resulted, and some geese probably didn't nest at all. Conditions were not as severe in the western Arctic, so production will be closer to normal for snow geese, white-fronted geese and small Canada geese from this area. Waterfowlers in the eastern part of the flyway Central Flyway are likely to see fewer young birds in the fall flight of snow geese. Even though overall duck numbers look promising -- up 13 percent from 2008 and more than 25 percent above the long-term average -- hunters in the Pacific Flyway might not be in for the same bonanza as waterfowlers in other flyways. As a whole, much of the Pacific Flyway's waterfowl production was considered average. Two traditional waterfowl survey areas Pacific Flyway states depend most on for late-fall migrants had underwhelming results. In some regions, nesting ducks were down considerably from 2008. "Although duck numbers were generally up across the U.S. Fish and Wildlife Service traditional survey area, total duck numbers in Alaska, Oregon and California were down compared to last year," according to Brandon Reishus, assistant game bird biologist for the Oregon Department of Fish and Wildlife. Interior Alaska, the Yukon Territory and Old Crow Flats region habitat conditions were generally good. A dry spring limited widespread flooding, which hinders early nesting waterfowl such as pintails. They decreased by 26 percent from 2008 in this region. Territories stayed relatively the same as 2008, but the total breeding population estimate is still below the long-term average. Southern Alberta produces many of the ducks and geese that migrate through the eastern half (interior states) of the Pacific Flyway. Record dry conditions in Alberta's Prairie Pothole Region translated to a 22 percent decrease in breeding populations. "The eastern side of the Pacific Flyway will see less young birds this coming hunting season because of the drought conditions during the breeding season in Alberta and parts of Saskatchewan," according to Rick Northrup, game bird coordinator for Montana Fish, Wildlife and Parks. Coastal states didn't experience much better results. Total duck breeding estimates fell 8 percent in California and 17 percent in Oregon, and both states are well below long tern averages. Estimates in Washington fell slightly, too. Waterfowlers near the coast should experience about the same number of migrating mallards this season. The Alaska, Yukon Territory and Old Crow Flats region and the central and northern Alberta/northeast British Columbia/Northwest Territories region breeding counts were similar to 2008 estimates. Although that's relatively good news, mallards in southern Alberta were 14 percent below average, so hunters in the eastern states will most likely see fewer mallards migrating through the area. "While breeding duck indices were down in most areas which contribute a large percentage of their birds to the Pacific Flyway, this doesn't necessarily translate into reduced hunter success," Reishus said. "What hunters will see as far as duck numbers will depend on local habitat conditions and a large degree on local and regional weather patterns." Mallard numbers in Washington, Oregon and Nevada decreased from 2008, while California numbers were on par with last year. "In California, mallard breeding efforts were similar to last year," according to Jake Messerli, California Department of Fish and Game waterfowl and wetlands program director. "Hunters will be seeing about the same number of young birds this coming fall, and first-year birds are far more susceptible to hunters due to their willingness to come to calls and decoys." Pintail numbers remained relatively steady throughout the region. Even though pintails had a good year relatively speaking, they are still below long-term population averages. For the first time in a dozen seasons, Pacific Flyway hunters will be allowed to take two pintails daily. The Pacific Population of Canada geese that nests west of the Rocky Mountains from northern Alberta and British Columbia south through the Pacific Northwest to California showed a 47 percent decrease from the unusually high 2008 estimate, but is similar to other recent surveys. Canada goose estimates increased in Washington, California and Nevada from 2008, but decreased slightly in Oregon. Biologists expect the 2009 fall flight to be average for the western portion of the flyway. d increased only in Utah. However, slightly improved wetland conditions were reported by most states. Hunters who pursue the Rocky Mountain Canada geese should expect an average flight. The Pacific population of white-fronted geese experienced good production, so a strong fall flight is expected. Fall flight predictions of other geese in the Pacific Flyway -- brant, dusky Canada geese, cackling Canada geese, lesser and Taverner's Canada geese and Aleutian Canada geese -- are expected to be near average and similar to last year. However, the fall flight of snow geese and Ross's geese is expected to be larger than average.